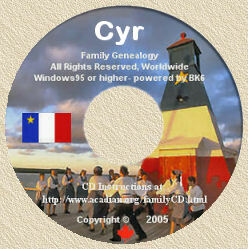 Acadian Genealogy Homepage; Acadians Petition for Land Grants! All the settlements on the lower St. John River were already flourishing at the time of the American Revolutionary War. The thirteen colonies of America, tired of the exigencies of the mother country, revolted and broke the tie with England in a violent war for independence. France, being mindful of her defeat in 1760, threw her lot with the insurgents. The Acadians, having taken the oath of allegiance without reservation, remained loyal and faithful to England despite the incessant demands of Washington and Lafayette. The Acadians of the Lower St. John in particular, were at the service of the English Canadians and were of great help to the governors of Quebec and Halifax, by carrying the mail and war correspondence and by protecting all lines of communication between the two capitals. The Rebels were victorious. The English flag stopped waving over the largest, the wealthiest and the most populous colony of North America. The Confederates' victory was the indirect cause of another exodus of the St. John River and the Bay of Fundy. The English Loyalists and the British Empire, being targets of the Confederates, were jailed on the least pretext, and were evicted from their property as if they were simple Acadians. It became intolerable for them to live any longer in the new Republic. It is then that several Loyalists decided to follow the British flag to Canada. More than 30,000 Loyalists went to New Brunswick, and this immigration was the cause of the erection of a new province detached from Nova Scotia. Parrtown was at first the capital of New Brunswick but two years later, in 1784, Fredericton became the seat of the government, whereas Parrtown became the historic St. John, a name it has kept to this day. Strange to say, these newly arrived English Loyalists, who had been persecuted in the neighbouring republic and who had been expelled, should have been full of sympathy for the Acadians. On the contrary, they became unbearable neighbours, by burning the fences of the Acadians, by stealing their cattle and by opening the doors of basements during the coldest days of winter to let their vegetables freeze. They wanted to get rid of these French Squatters. Governor Thomas Carleton had to intervene more than once, to have the English return to the Acadians what they had unjustly taken. Governor Parr of Nova Scotia, became anxious on account of the war-like attitude of his new Anglo-Saxon subjects, but he never dared displease them. He informed Governor Haldimand of Quebec concerning his anxieties, who in turn proposed a workable plan. Haldimand had often thought of a settlement in the Upper St. John Valley, where these people could defend and protect the travelers, as well as the mail routes in that solitary area. "Mercure, the Acadian recently returned from your Province, tell me that several of his people wish to migrate to this Province for love of their religion, which they believe they can follow here with greater freedom and less difficulty. My plan is that you give them grants near Grand Falls on the St. John River, settlements which could probably extend as far as the St. Lawrence River, and which could greatly help facilitate communications between the two provinces." On receiving this letter, Parr was jubilantly pleased. He had already confiscated several farms from the Acadians and now all he had to do, was concede the deeds to the Loyalists. This he did a few days before the arrival of the first Governor of New Brunswick, Thomas Carleton. The new Governor showed more justice and more sympathy toward the Acadians, although he often had to bow under the pressure exercised by the pioneers from New England. In 1782, the farmlands cleared by French pioneers were confiscated and conceded by Parr, to Sir Andrew Snape Hammond for his services. Hammond however, did not harass the tenants, but in 1786 these farms were deeded to the Loyalists who, without pity, evicted the Acadians. It is encouraging to note that two Loyalists, Edward Winslow and Ward Chapman, showed some interest toward the evicted Acadians and obtained for them, land grants from the New Brunswick Government. Dated November 23, 1786, these grants were conceded to 42 citizens, 15 Acadians and 27 Loyalists. As a result of the grants, the French were deeded farmlands in an area where the English had a majority. From the list of grants, we find the following names; Daniel Michaud, Francis Violette, Charles Blanchard, Jean Robichaud, Jacques Deveau, Benoit Girouard, Olivier Thibodeau, Joseph Martin, Jean-Baptiste Dominique. All these, isolated by a majority of English grantees, sold their lands to come to Madawaska. In July 1783 Major Gilfred Studholme, military commander of Fort Howe at St. John, sent a committee to inspect the upper region of the St. John Valley and asked the same committee to report on the possible colonization of that part of the province. In the report, we notice that the little colony of Springhill near Fredericton, founded since 1768, was the most prosperous Acadian settlement. There were 61 families, or a population of 357. The report further states that the heads of the families had helped the government during the War of Independence. Among these we find Jean Martin and his four sons, Simon, Joseph, Francois and Armand; Louis Mercure, Joseph Daigle, Jean-Baptiste Gaudin, Olivier CYR and his brothers, Pierre and Jean-Baptiste. These pioneers were highly recommended to the government for services rendered and yet, Governor Carleton confiscated their lands and gave them to the Loyalists. It is thus that 500 faithful and loyal subjects were rewarded for their services! We must be reminded that the Acadians had taken the oath of allegiance without reservation and had to remain faithful to Britain as they had promised. But as ever, the English always came first when the present interest of the fatherland was concerned. When the new eviction notice was made known, the Acadians addressed a petition to officials in Quebec and New Brunswick, to obtain lands in the Madawaska area. The first petition addressed by Louis Mercure to Major Holland, general surveyor of Quebec, is dated February 24, 1785, and at the bottom of the petition we find 24 names of Acadians and Canadians who asked land grants in Madawaska, a mile and a half south of the Madawaska River Falls. Acadian petitioners were: Louis Mercure, Jean Martin, Joseph Daigle Sr., Joseph Daigle Jr., Daniel Gaudin, Simon Martin, Armand Martin, Paul CYR, Francois CYR, Joseph CYR Jr., Pierre CYR, Jean-Baptiste CYR, Firmin CYR, Alexandre Ayotte and Francois Martin. The Canadian pioneers were: Pierre Duperry, Jean Lizotte, Pierre Lizotte, Augustin Dube, Robert Fournier and Louis Sansfacon. Another petition found in the Canadian Archives, was addressed to the Governor General of Canada. This petition was signed by Jean-Baptiste CYR, his wife Marguerite Cormier, and his nine sons Pierre, Olivier, Francois, Antoine, Paul, Jacques, Joseph, Firmin and Jean-Baptiste CYR Jr. It was also signed by Alexandre Ayotte, Zacharie Ayotte, Joseph Daigle Sr., Joseph Daigle Jr., Olivier Thibodeau and Louis Sansfacon. We know that another petition was signed by Joseph Daigle and 24 other pioneers asking for grants in Madawaska. The deeds were to be given to those who would be granted them, and a subsidy of 200 acres in Madawaska would be given to each family. A few days after receiving this promise, Jean-Baptiste CYR held a meeting at his residence, where he decided that half of the colony would go to Madawaska, the other half to be equally divided among Memramcook, Miramichi, Tracadie, Caraquet and Bathurst.